It floats like a butterfly, but stings like a bee -- a BIG bee! 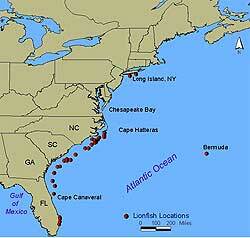 And it's invading the coastal waters of the eastern United States. What is it? It's the lionfish (Pterois volitans) and it is packing a punch to the nervous system of anyone unlucky enough to touch it. Lionfish are native to the South Pacific and Indian Oceans, not the western Atlantic Ocean. The National Oceanic and Atmospheric Administration (NOAA) believes that the East Coast invasion of lionfish started when people dumped their pet lionfish into the ocean. 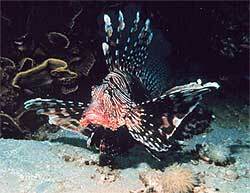 The lionfish are spreading in their new habitat and have few natural predators in these waters. 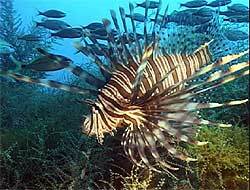 On May 21, 2004, NOAA issued a warning to divers and fishermen: use extreme caution around lionfish! The lionfish has spines that can deliver a painful sting. A venom gland is located at the base of each spine. The venom is a combination of protein, a neuromuscular toxin and the neurotransmitter called acetylcholine. 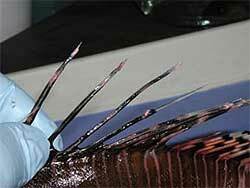 After a spine punctures the skin, the venom travels up a groove in the lionfish's spine into the wound. Although the sting is not fatal, it does cause intense pain and swelling around the wound. The pain is greatest approximately 1 to 1.5 hour after the injury and usually lasts 6 to 12 hours. Some people have pain or tingling sensations around the wound for several days or weeks. On rare occasions when the venom spreads to other parts of the body, people may experience headaches, cramping, nausea, paralysis, seizures and chills. Remove the spine (if it broke off in the skin). Place the wound in hot (45oC) water for 30-90 minutes or until the pain is gone. Give a tetanus shot and possibly antibiotics. Many ocean animals have venoms or poisons that target the nervous system: the blue ringed octopus, cone snail and pufferfish. Add the lionfish to this list. LIONFISH: beautiful, but dangerous. Look, but don't touch! Vetrano, S.J., Lebowitz, J.B. and Marcus, S. Lionfish envenomation. Journal of Emergency Medicine, 23:379-382, 2002. Church, J.E., Moldrich, R.X., Beart, P.M. and Hodgson, W.C. Modulation of intracellular Ca2+ levels by Scorpaenidae venoms, Toxicon., 41:679-689, 2003. Garyfallou, G.T. and Madden, J.F. Lionfish envenomation, Annals of Emergency Medicine, 28:456-457, 1996.